Generous and friendly at every level of engagement. The Inn is convenient to the ferry, Mojos Restaurant and with a golf cart an easy ride to sights and activities. Danny and Gail were wonderful hosts. The wine and cheese in the afternoon was delightful. Nice time to meet other guests. Breakfast and Wine hour were wonderful, great food and wine selections. Outstanding attention on each and every detail of the Inn. Would return in a heart beat and hope to do so very soon. DAN and Gail exceeded our expectations. They have the right touch! The owners were super helpful for everything from the reservation to things to do and available amenities. We really enjoyed our stay on Bald head Island but what made it special was the Inn at Bald Head Island. We have already recommended the Inn to many friends and anyone that will talk to us about BHI! Everything was perfect. Dann and Gail are truly the best hosts. Everything from the check in process to the breakfast and happy hour food/beverage was top notch! We stayed for only 2 nights but it felt like a week vacation. I cannot wait to come back for another visit and stay at the Inn! Thank you again Dann & Gail! Staff & owners bent over backwards to make stay enjoyable, relaxing & memorable. Every need was met and then some. A wonderful & special treat. The Innkeepers, Dann and Gail along with their entire team were welcoming and went above and beyond to make my stay PERFECT. The breakfast each morning and Happy Hour food was outstanding. The fried oatmeal bites with warm syrup were a special treat one morning. Words cannot describe how I felt after my 2 night stay. I felt like I had been on vacation for a week, and I plan to return often. As a full time meetings professional who works with the top hotels in the Country, the Inn ranks with the best. Words cannot describe how I felt after my 2 night stay. I felt like I had been on vacation for a week, and I plan to return often. As a full time meetings professional who works with the top hotels in the Country, the Inn ranks with the best. I had an amazing vacation and cant wait to come back! When we checked out after our weekend visit, we hugged Dann and Gail goodbye, assuring them we will return. In all the years we've stayed at various lodging facilities, we have NEVER hugged the staff goodbye! They are wonderful hosts! This was our first stay at The Inn at Bald Head Island. In fact, it was our first stay at ANY bed and breakfast in our 36 years of marriage and we weren't sure if we would like the "bed and breakfast" experience. Dann and Gail immediately made us feel welcomed, made us feel like we were staying with family. We are already planning our return visit! the breakfasts were wonderful, and the afternoon wine and cheese were great and a fun way to meet the other guests. Both Dan and Gail were excellent hosts. Both the breakfast and happy hours were excellent and we very much enjoyed our conversations during those times with the other guests as well as our hosts. 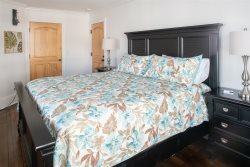 Inn is first-class and location on the island is ideal. Dan and Gail are fabulous host and hostess. We felt welcomed and treated as special. The breakfast and afternoon wine and sppetizers were delicious and certainly out of the ordinary. We have already recommended the Inn to several friends. Everyone was very nice and friendly and was very willing to assist in any way!! Will come back many times. Very pleasant inn. Relaxed and very comfortable in well maintained setting. Everyone at the Inn was so helpful and offered lots of suggestions regarding dining, beaches and information about the Island. We loved visiting with the owners and the rest of the staff. I wouldn't stay anywhere else when visiting Bald Head. The owners attention to detail is over the top. If my husband and I are lucky enough to visit again, we will definitely stay at The Inn.